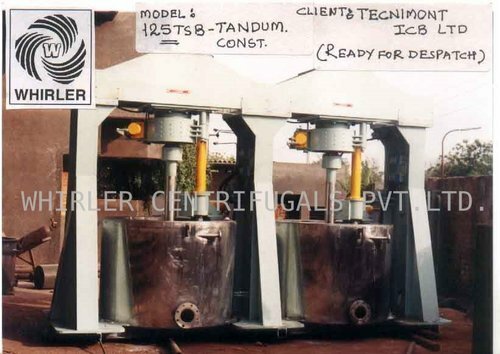 We are a glorious exporter, a supplier of Top Suspended Bottom Discharge Centrifuge that is manufactured as per the industry norms at our vendors’ end. Widely used for solid-liquid separation in sugar Industries, these are massively applauded for their efficient performance. Offered batch is used for solid-liquid separation for DMA in pharmaceutical industries. Price starts from 185000 for 24" MS Top Suspended Bottom Discharge Centrifuge to more than 3000000 for 48" SS 316 Fully Automatic Top Suspended Bottom Discharge Centrifuge. Established in the year 1988, we, "Inqzin Sales & Services Private Limited", as one of the distinguished Manufacturer, Exporter, Wholesaler and Trader of Industrial Centrifuges, High Performance Vacuum Pumps, Industrial Washing Machines, Dry Cleaning Machines and High Vacuum Booster Systems. We have operations in larger manufacturing premises of about 19000 Sq. Ft. located in the prime industrial location of G.I.D.C. Vatva and Odhav. With over 25000+ Installation of Vacuum Pumps and 5000+ Installation of centrifuges since four decades we have established ourselves as a leading supplier for many limited and international customers. The company is promoted and run by technocrats and Engineers with a rich industrial experience of about four decades and covering areas of Production, Planning, Design, Testing, Marketing, Servicing etc. with modern management practice. All our products are provided in multiple specifications to meet the diverse client requirements. Being a quality-conscious company, we make use of supreme quality raw materials that are procured from our trustworthy vendors and supplier. Furthermore, we follow the preset industry norms to achieve best quality possible. We also offer installation and operational training of the offered series. We are exporting our products in all over the world. We are backed by a state-of-the-art infrastructure facility that is set up in Ahmedabad, Gujarat, India. with multiple machines and tools that are based on modern and advance technology. Not only our machines support us with the hassle free production, but also help us in attaining the exact requirements of our clients, without compromising with the quality. We have hired a team of efficient professionals that is well experienced and trained to meet the varied client demands on time. Aarti Industries, Santosh Starch and Alta Industries are some of the key customers in market.